This vent cover lets you keep your RV roof vent open at all times, letting in light and air while keeping out rain. Lid swings open for vent access and cleaning. Vents on 3 sides provide extra ventilation. Includes mounting hardware. Lowest Prices for the best rv vents and fans from Camco. 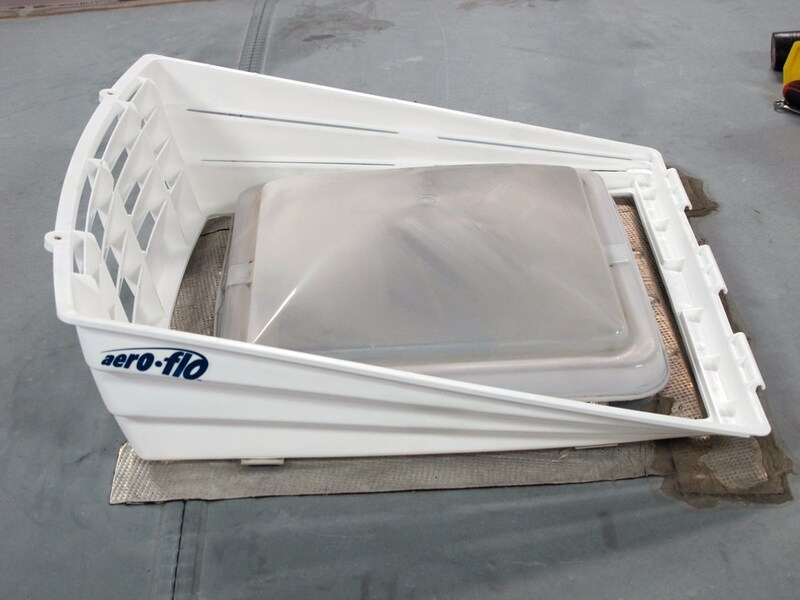 Camco Aero-Flo RV Roof Vent Cover w/ Swing Open Lid - White part number CAM40421 can be ordered online at etrailer.com or call 800-298-8924 for expert service. 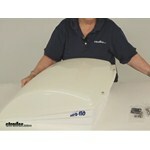 This vent cover lets you keep your RV roof vent open at all times, letting in light and air while keeping out rain. Lid swings open for vent access and cleaning. Vents on 3 sides provide extra ventilation. Includes mounting hardware. Keep air circulating through your RV without letting in rain. 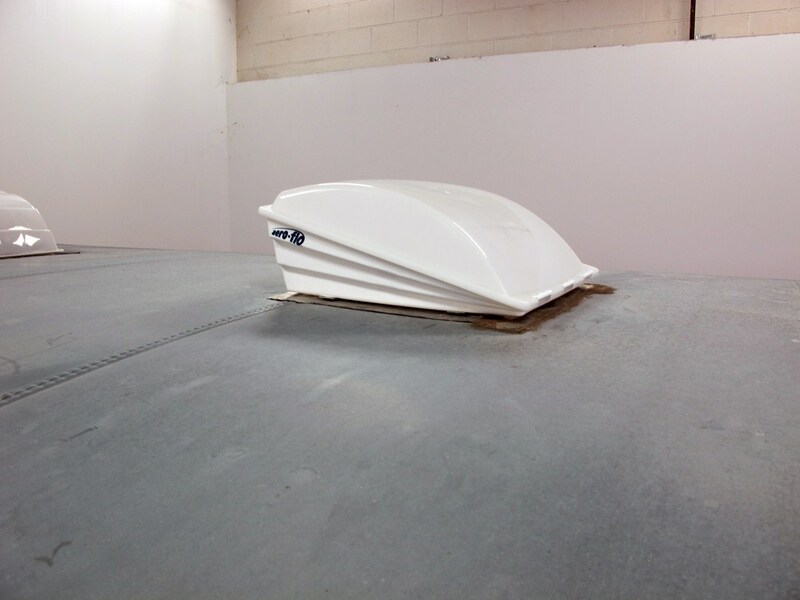 This aerodynamic vent cover gives you the freedom to leave your RV roof vent open in any weather, when driving down the road, or when you're away from the RV. 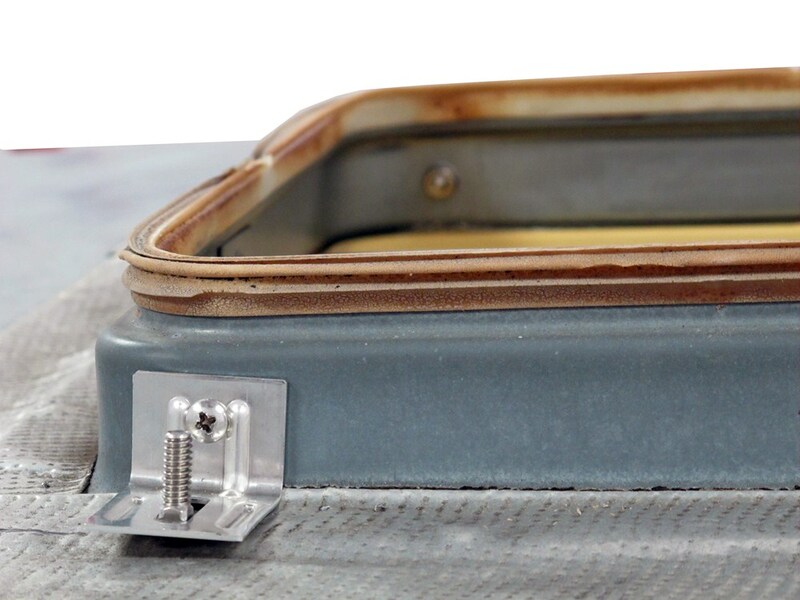 The cover mounts to your vent frame, not your RV's roof, so you won't have to worry about leaks. Drill holes into your existing vent frame using a 3/16" drill bit, then attach the L-shaped mounting brackets using the included screws, nuts, and washers. The vent cover secures to the mounting brackets using carriage bolts. Simply slide the holes in the cover onto the bolts and tighten using the included washers and nuts. 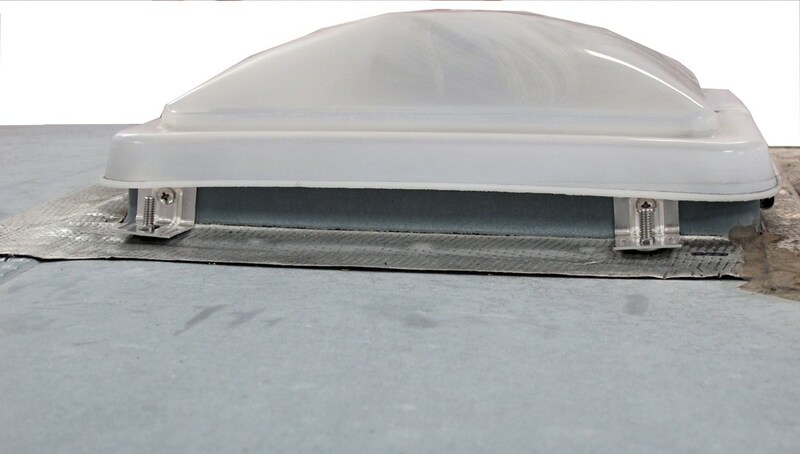 UV-resistant cover installs over your roof vent so you can open the vent and operate the fan in any weather. Removable bug screen keeps insects out. Zero-Leak mounting brackets and hardware eliminate the need to drill into your roof for installation. Perfect for use with high-powered fans, this cover has a wide vent area so that it provides more airflow than standard covers. EZClip pins allow the cover to be opened and closed with ease. No-drill installation on MaxxFan and MaxxFan Plus vents. 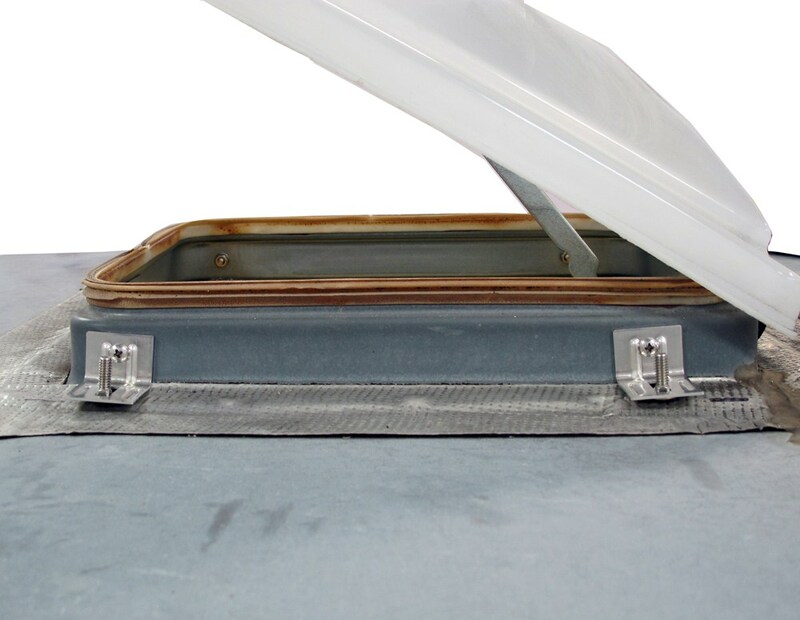 The built-in rain shield on this powered roof vent protects the interior of your RV or camper from rainwater. The reversible, 10-speed fan has a thermostat to regulate airflow inside your RV. Ceiling fan mode circulates air when vent is closed. Fan-Tastic Vent Roof Vent w/ 12V Fan - Clamp On - Manual Lift - 14-1/4" x 14-1/4"
Fan-Tastic Vent Roof Vent w/ 12V Fan and Thermostat - Powered Lift - 14-1/4" x 14-1/4"
Fan-Tastic Vent Roof Vent w/ 12V Fan and Thermostat - Manual Lift - 14-1/4" x 14-1/4"
Today were reviewing part number CAM40421 from Camco. 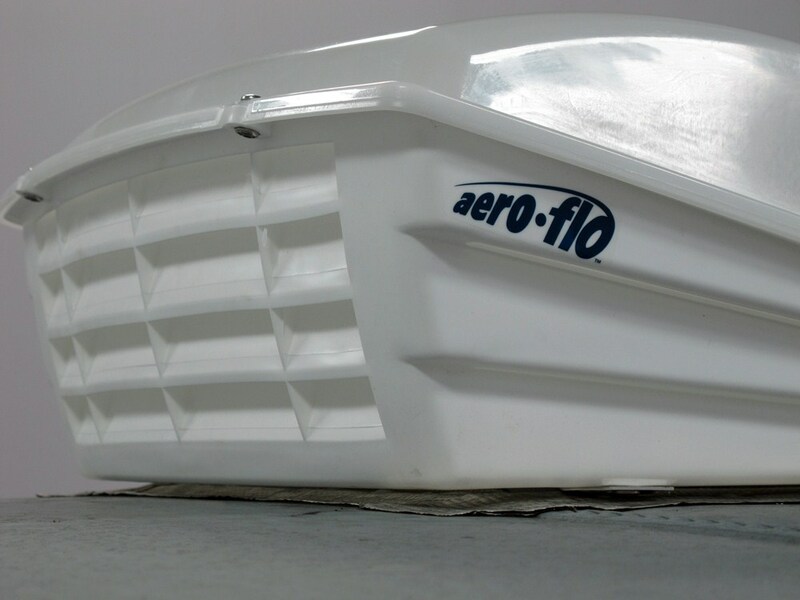 This is the aeroflo RV roof vent cover with a swing open lid. Its made of a strong polypropylene plastic thats lightweight, but resists breakage. The shape is aerodynamic. The air flows this way from the front, so that minimizes drag and saves a little gas mileage. 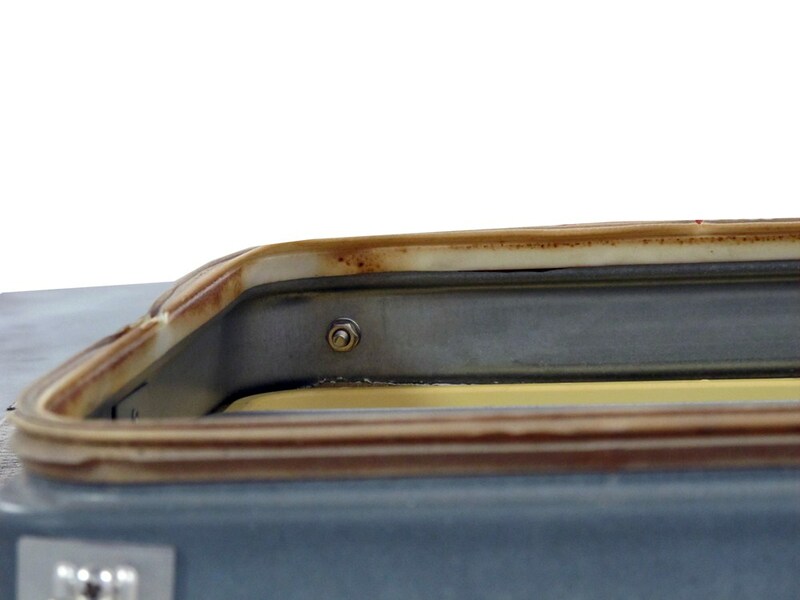 The swing open lid gives you easy access to your roof vent for cleaning. It has hinges on this side and two screws on this side and you simply loosen the screws and lift the lid. You can take it completely off if you want. Then to replace it just put it back on the hinges and then tighten the screws down and youre ready to roll. It has vents on three sides. You have louvers on the rear that let in fresh air and then you also have air slots the length of both sides, so you can see on that side and on the other, so youre going to get maximum air flow. Youre also going to get some light inside your RV. This does not block sunlight completely. It gives you diffuse light, so its not going to be dark inside your RV when you use this cover. When you mount this youre going to use the included hardware and youre going to drill into the roof vent frame rather than the roof of your RV, so that will help to keep this leak proof. It fits standard 14 x 14 inch roof vents. It is 22-1/2 inches long and its 20 inches wide. At its tallest its 9 inches high. 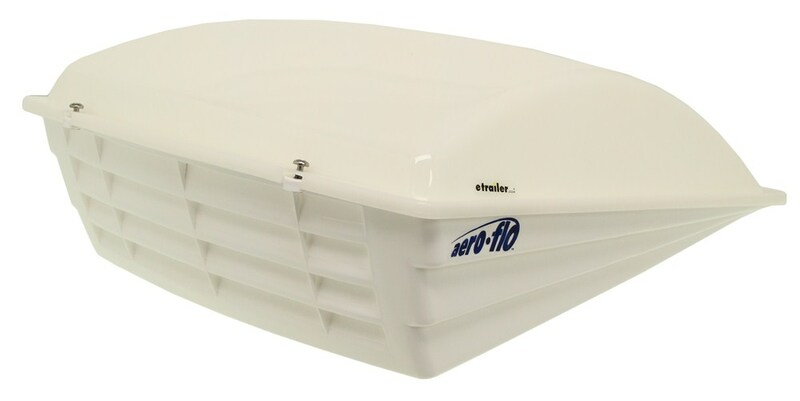 This unit does come with a one year limited warranty and there you have it for part number CAM40421 from CAMCO, their aeroflo RV roof vent cover with a swing open lid. .
Order: RelevanceNewestRating - High to LowRating - Low to High This vent cover lets you keep your RV roof vent open at all times, letting in light and air while keeping out rain. Lid swings open for vent access and cleaning. Vents on 3 sides provide extra ventilation. Includes mounting hardware. Do you have a question about this RV Vents and Fan? 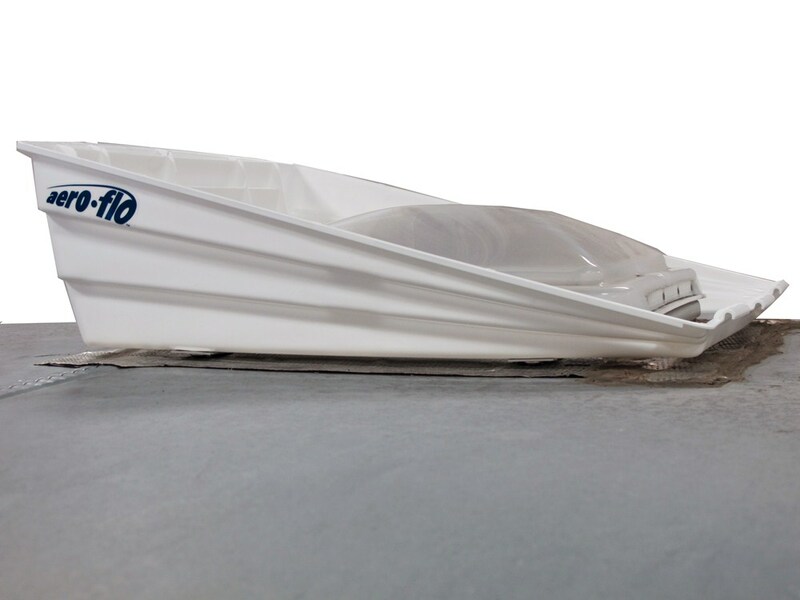 Since the Camco Aero-Flo Vent Cover attaches to the existing vent, you will not have any fasteners piercing your roof. Caulking would not hurt anything, but according to Camco, it's not necessary. 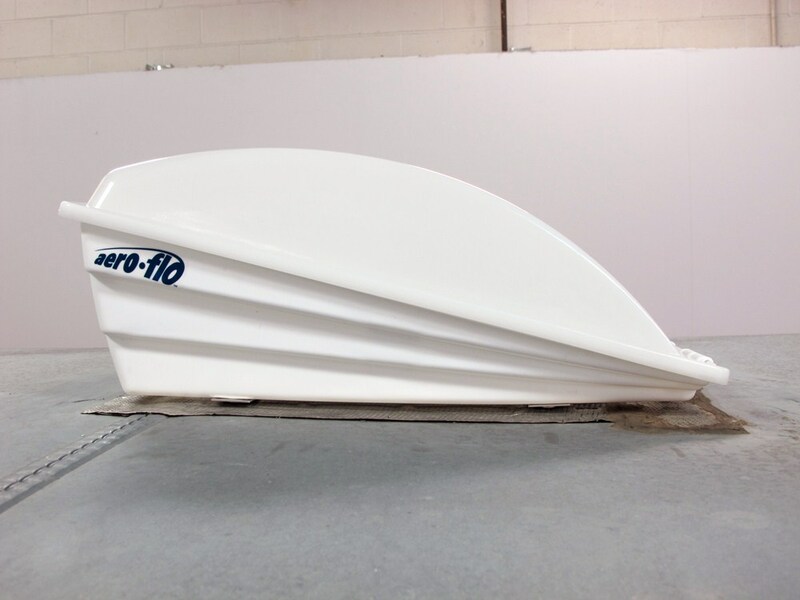 If you click the provided link, you can see a video of the Aero-Flo vent cover being installed. The 9 inch height of the Camco Aero-Flo RV Roof Vent Cover # CAM40421 does not allow roof vents to open all the way but the vent would still open far enough to get the needed airflow. I attached an install video for this cover for you to check out as well. 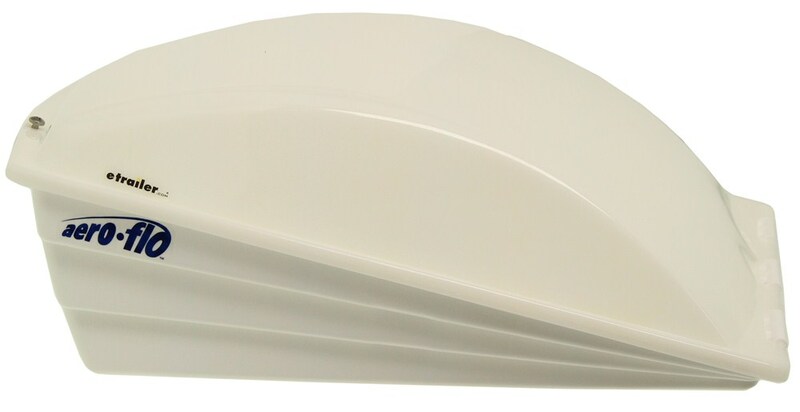 The mounting hardware that comes with Camco Aero-Flo RV Roof Vent Cover # CAM40421 will remain covered and protected from the elements most of the time. It can swing open for access to the vent but otherwise it is closed. Given enough time any hardware could start to form corrosion. Roof vent covers like the part # CAM40421 aren't as tall as a roof vent lid when fully opened because with the vent style these fit the vent is basically at full functionality when the lid is only partially opened. In general these vents do not flow a crazy amount of air so the lid being opened at a lower angle wouldn't flow any less air than one opened all the way up. Yes, the pop up cover part # CAM45764 that you referenced will fit your 14.1 foot trailer that has the Camco Aero-Flo RV Roof Vent Cover # CAM40421 installed. The cover is designed to accommodate trailers that are up to a few feet longer than yours so it would accommodate the vent cover easily. 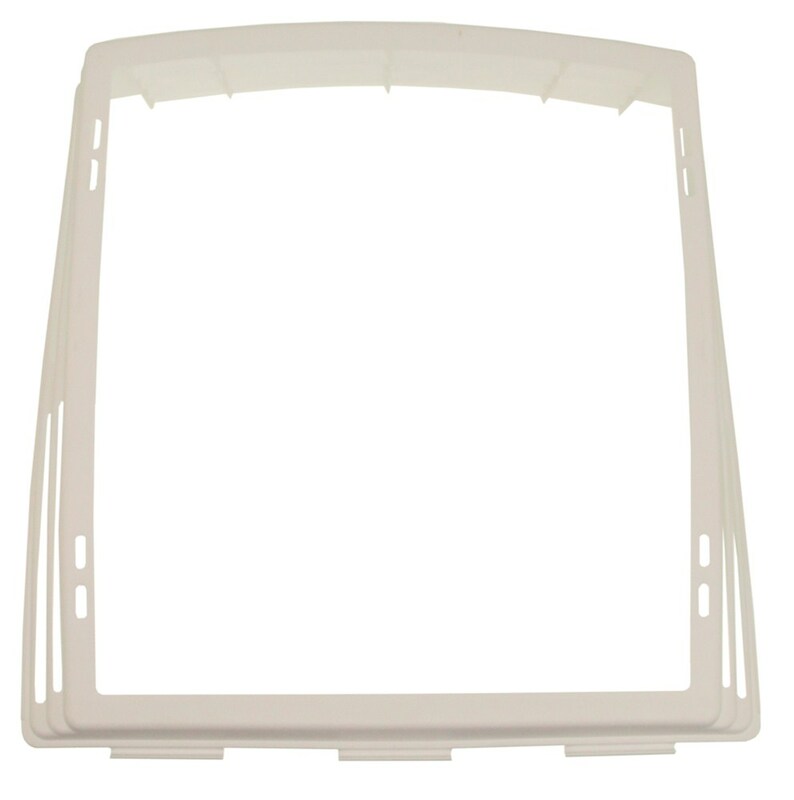 We only have the Camco Aero-Flo RV Roof Vent Cover # CAM40421 in white but we do have the Camco RV and Enclosed Trailer Roof Vent Cover # CAM40443 in black which comes with a detachable screen so that you can easily get to your roof vent as well. 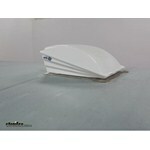 Highest quality rv vents and fans for the best price. Most detailed, accurate rv vents and fan information available.